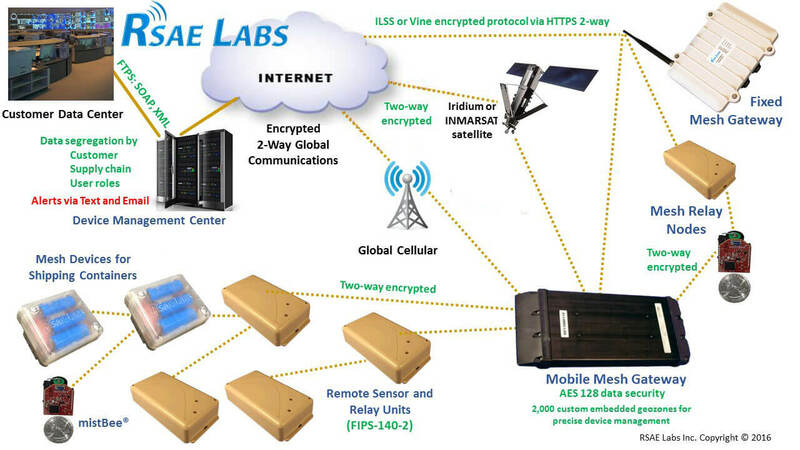 mist® is an advanced wireless mesh protocol. While mist® meets the physical layer specifications for the 802.15.4 2.4 Ghz, it is a totally unique stack. Several features differentiate it including data security (FIPS 140-2, AES-128 unique keys per link), scaling (10,000s of devices, 100s of hops), position beaconing (GPS-denied locating), ad hoc/self-healing (every node can be an end-node, routing node and position beacon), power efficiency (battery powered routing nodes lasting 1-year+ on a standard A cell). 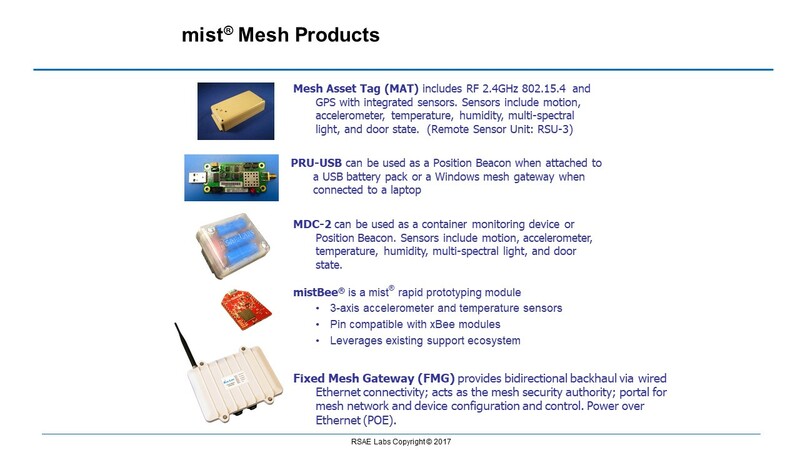 Unique to mist is the ability for every device to serve as both a low-power sensor node and a network routing node. This allows mist to automatically form without any prior provisioning of router assignment and network path. Furthermore, mist self-optimizes by always looking for a “parent” node closer to the mesh gateway with the fewest number of hops. A hierarchical network forms from the gateway as devices are authenticated using AES 128 encryption. 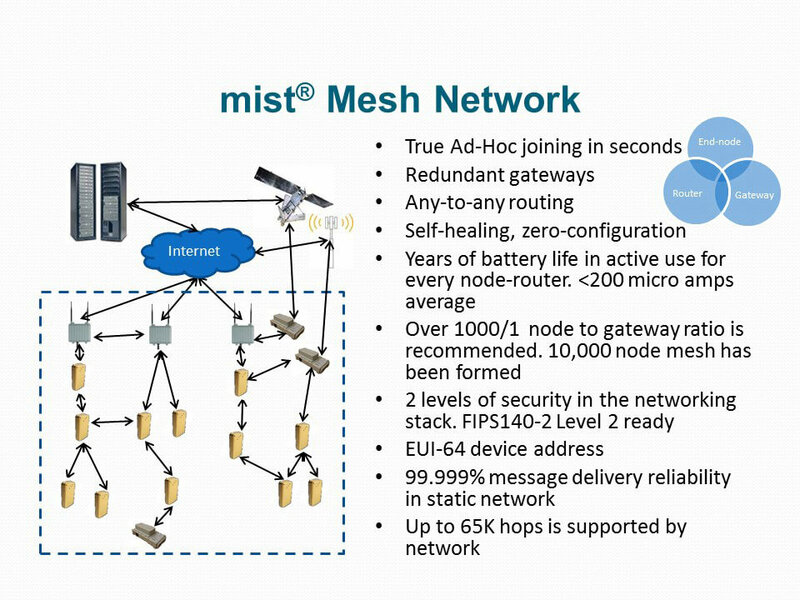 In actual deployments, the size of a mist mesh network can easily exceed 1000’s of nodes and support a very large number of hops (>100). 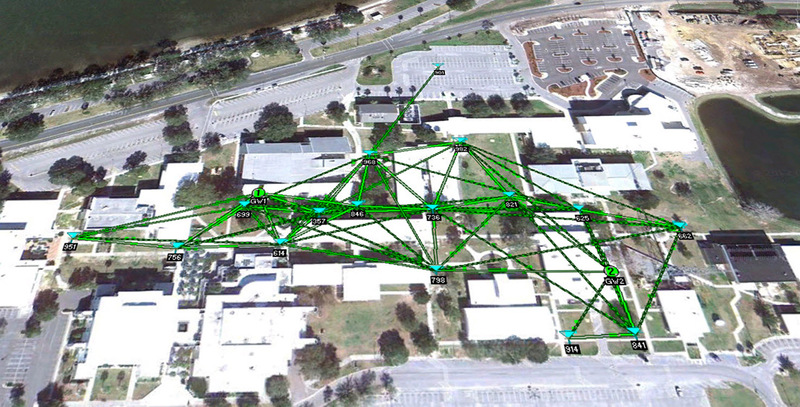 The largest mist mesh network formed to date consisted of 6,500 devices, meshed to the same gateway. 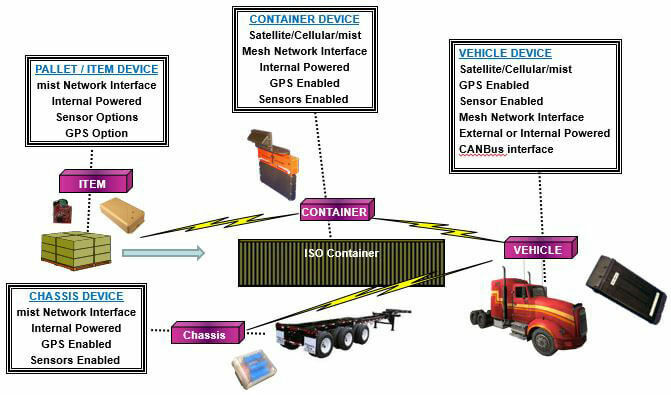 This ad hoc mesh network was configured with network and security credentials prior to deployment in Afghanistan in support of the US DoD in 2013. A key distinction of mist networks, even operating with thousands of meshed devices, is that the battery life of the networked devices is excellent and very deterministic for a given network configuration. mist® devices and gateways are available in a variety of physical configurations and sensor feature sets. A mist® Evaluation Kit is offered to allow new users to quickly get up to speed and develop their specific applications. Each mist device can be configured to broadcast a position beacon. This beacon is sent via a signal separate from its normal data transmissions to provide position data in GPS denied environments. Other mobile mist tags can determine their position in relation to nearby position beacons. The signal power of the position beacon can also be reduced compared to the normal mesh transmission power, thereby allowing the position beacon to be more precise.